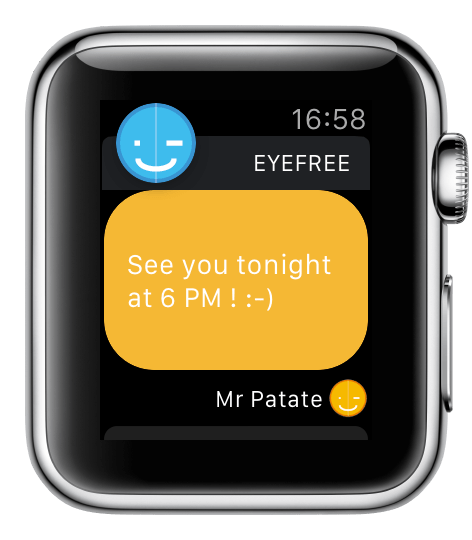 With Morse Talker on Apple Watch you can consult messages exchanged with your contacts but you also have the opportunity to reply their directly from the watch ! In addition, you have an interactive notification system allowing you to see at a glance your new messages. The home screen displays a list of your contacts. By clicking on ABC you view the alphabet. The red badge next to the name of the contact means that there is an unread message. Writing a new message is performed in the same way as on the iPhone. Only interactions are different. Here, no possibility to drag your finger on the screen. Therefore we added the three buttons visible above. 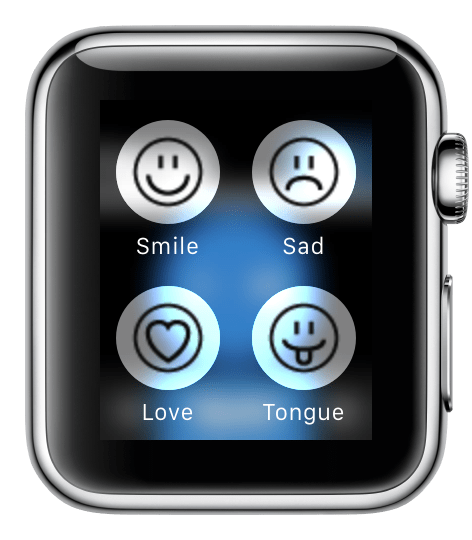 A force touch on the Apple Watch screen allows you to add Smileys. The message status is reported on the same way as the iPhone. You always have the possibility try again to send a message not shipped by clicking on the red button. Notifications let you see immediately the new message received and its sender. By sliding the finger up you can either mark message as read (for no longer see the red badge on the Morse Talker icon) or reply directly to your contact from the Apple Watch ! 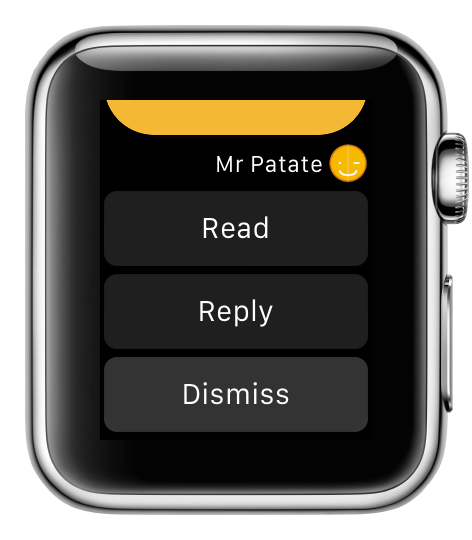 Morse Talker allows you to send messages from Apple Watch and iPhone using a keyboard based on a simplified version of Morse. 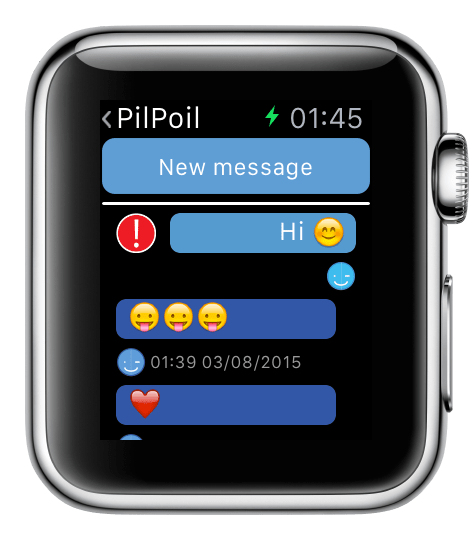 Only the three buttons above are necessary for type your messages, ideal for the Apple Watch small screen and a great way to write without have your eyes glued to the screen ! If you do not know Morse on the tip of fingers, take a look at the available alphabet since the entry page. Do not worry, this language is learned very quickly ! - tap quickly successively on : long, long, short (--. means g in Morse). - wait a very short time the letter g is taken into account and displays. - tap quickly successively on : long, long, long (--- means o in Morse). - wait a very short time the letter o is taken into account and displays. - tap Space to move to the next word. TIP : A double tap on Space allows you to Capitalize the last character or vice versa. 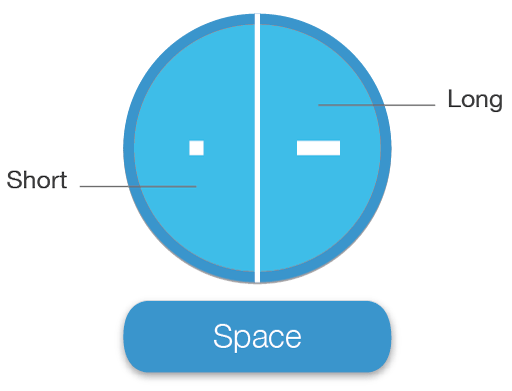 The time between the letters can be defined in part Settings in Time between two characters (with shorter time for the most experienced of you). TIP : hold on the button below to clear more quickly the last characters. - If you see a date, it means the message was sent (at the time indicated). 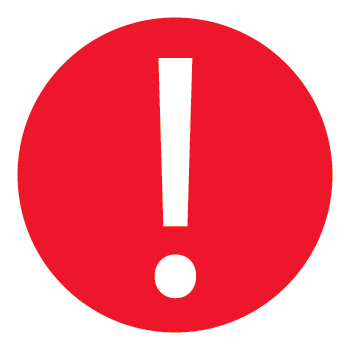 - Finally, if you see the symbol below, it means that the message has not been sent fault to Internet connection. Once you have access to the Internet, click on it to try to send the message again. Regarding your account : it is stored online, the list of your contacts and you settings are saved but not your messages. Once read, they are deleted from the server. You turn now : "Morse" ! Morse Talker Widget allows you to quickly send a message to your recent contacts. 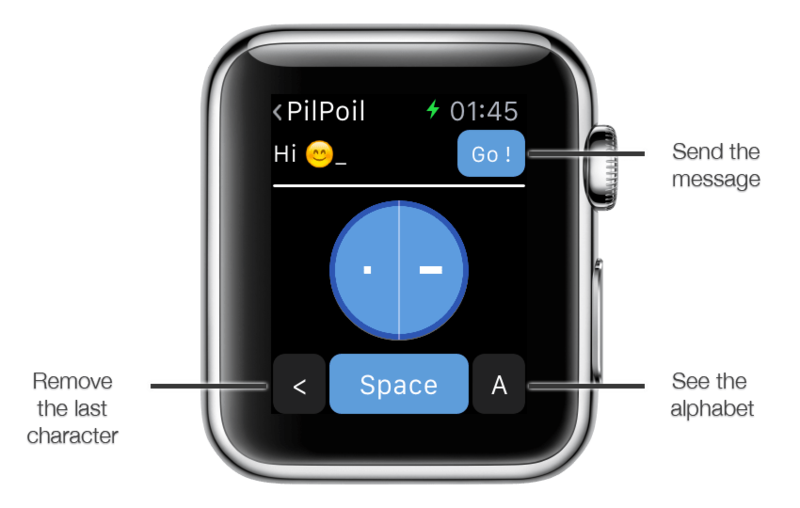 Widget operation is the same as for Apple Watch where interactions have been replaced by buttons : Send and Delete. The message can only be sent to one of yours 3 most recent contacts. Select the recipient from the left side of the Widget. When you click on Send, a message informing you that the message is being sent. It then informs you that the message was sent or that there was a connection problem. If this is the case, open Morse Talker to try send it again.